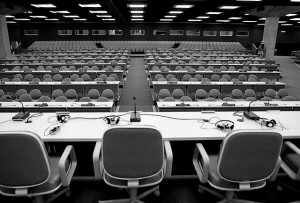 A view of Plenary Hall before the start of the 1992 Earth Summit in Rio de Janeiro — the same location where U.N. delegates will gather this week for Rio+20. U.N. Photo/Michos Tzovaras. Bill McKibben, the renowned environmentalist and author, gave the keynote speech at last weekend’s Strategies For A New Economy conference at Bard College. Speaking with a perfect balance of humility and conviction he praised the work of the conference while also challenging participants to remember that ushering in a new economic paradigm based on principles of sustainability and justice isn’t only about coming up with new theories, designing new policy and building new institutions. It also requires directly confronting political and economic power, namely that of the oil companies and their financiers, which actively struggle to uphold a system headed for disaster. He dismissed the failure of the 2009 United Nations climate talks in Copenhagen and the half-measures taken at Durban last year — neither of which were able to secure a binding global agreement to reduce greenhouse gas emissions. He also preemptively condemned this week’s Rio+20 U.N. Conference on Sustainable Development as doomed without a stronger international climate movement to hold governments accountable. This last point hit close to home for me. I’m in Rio now, and I’ve been following the preceding negotiations for almost a year. It’s true that over the course of the last nine months I’ve watched as negotiators have bracketed and deleted basically any and all proposals that might have meaningfully challenged the global status quo. Civil society groups have successfully fought to retain human rights language in the text but ambitious proposals for things like the establishment an international financial transaction tax or a world environmental court went out the window fast. At this point, likely policy outcomes will be limited mostly to reforms of the U.N. system, such as the strengthening of the United Nations Environment Programme and the establishment of a process to replace the soon-to-expire (without having been met) Millennium Development Goals with new Sustainable Development Goals. Listening to Bill McKibben, I knew that he was right in terms of the actual political outcome of the conference, but I also am not so quick to dismiss it. Perhaps I’m being irrationally optimistic because of my personal investment in this process, but I think there are real possibilities for progress in Rio outside of the negotiating room. Rio+20 is, after all, not just a conference on climate change. Its predecessor, the 1992 Earth Summit in Rio, ushered in the now-ubiquitous phrase “sustainable development,” which concerns the fundamental question of how we understand the relationship between ecology and economy, as well as how we can provide for ourselves without undermining future generations. This conference therefore forces world leaders, over 130 of whom are expected to be in attendance, to talk about the basic dynamics of systems — or perhaps one large integrated system — in crisis. Climate is obviously a huge part of this, as it was 20 years ago when the Earth Summit produced the convention on climate change. The extent to which we can or cannot limit anthropogenic warming in the near term will have an enormous impact on the possibilities for lifting people out of poverty and vulnerability and ensuring the possibilities for peace. The nature of our global atmospheric commons makes international agreement a necessity. However, since Rio+20 has neither the mandate nor the political will to set emissions targets, it becomes something of a waste of time to try. If we give up now on the notion that Rio will be a “success” on climate policy we can instead focus on the possibilities for other kinds of victories. The Rio Centro convention center, where the conference is being hosted from June 20 to 22, already feels like something of a system in chaos itself. Rio+20 is expected to draw over 50,000 attendees, many of whom come from unions, youth organizations, non-profits, scientific organizations and other civil society groups. All of these come together with their own experiences of a system in crisis, and they’ve already been holding literally hundreds of panels, parallel conferences and side events in the week leading up to high-level negotiations. In addition, there are at least 20,000 activists, occupiers and researchers expected to attend the People’s Summit and related marches taking place downtown. The energy is frantic, the stakes are high, there isn’t a clear set of sides to pick and people are making connections all over the place. Just a few days ago, I ended up having a two-hour conversation about education, international solidarity and climate justice with a representative from a Malaysian energy-sector union organizer who just happened to be sitting next to me on the bus. The mood here is chaotic and self-organizing, but it is also bound together by the exchange of political ideas — which of course increase in value the more that different people are exposed to them. In a system like this, results are unpredictable. Unexpected connections can be made, great ideas can catch on very, very quickly, and new dynamics can emerge. Already there has been considerable cross-sector convergence around the imperative of phasing out fossil fuel subsidies — which total somewhere in the vicinity of $1 trillion globally per year, pad the profits of the richest corporations in history, cement global fossil fuel dependence, divert much needed public money from other social purposes and represent some of the worst examples of the corporate stranglehold on our governments. There have also been unexpectedly bold statements from groups like the International Trade Union Confederation drawing connections between capitalism, social welfare and climate change. I don’t know what will happen this week, but I’m hopeful that by the end of it we will have seen a few exciting and unexpected developments. I’m also hopeful that the clash between the dynamic nature of social movements and the inertia of a broken political-economic-ecological system — a system which very much includes the U.N. policy process — will create the kinds of feedbacks that can boost the strength, connectedness and shared sense of purpose among our diverse movements. Perhaps then we might have a better chance of holding states accountable in the climate process, while simultaneously keeping an eye toward the bigger prize of actually achieving the promises of sustainable development. Here’s the problem. The dilemmas of power vs. ethics and consumerism vs. sustainability will be decided in favor of those who hold the power. Until that power structure collapses, it is right and proper to pursue the only path of positive change available – that is, grassroots efforts at developing self-sustaining communities, new experimental economies, and so forth. But don’t delude yourself. On the way to its inevitable ruin, the current power structure will notice that you have not “paid your dues” into their coffers and will either swallow you up in the system and force you to capitulate, or they will kill you. Ask any member of an indigenous tribe in an area of “national interest,” and they will confirm that the latter can, does, and will happen if you persist in defying power. The inevitable conclusion that some of us have reached, then, is to continue to build upon what we know is right, continue to oppose repression and rampant lustful destruction of the environment, but don’t suffer from illusions of effectiveness. It is enough to know that you are acting from good conscience and from the heart, and that you are not allowing your soul to be swallowed by the machine. Nature and people work through networks not hierarchies. Ideas spread like viruses and produce individual and collective change. If you label Rio a failure based on the agreements coming from the official meeting, you are watching the wrong game! Sandmel is on to it. Really well put, Barbara, thank you. It’s absolutely right that we need to train ourselves to look for true people-power on the move, rather than that of hierarchies and figureheads. Still, however, I think Karen is right that what she calls the “machine” is still setting the agenda and even naming the occasion of the conference. We’ll know the roles are reversed, perhaps, when it’s the popular movements that are choosing the time and date, and the diplomats are the ones parasitically inviting themselves along. Alexander Patico I share the concern. I attended the summits in Rio (’92) and Johannesburg (’02), and miscellaneous prepcoms, workshops and planning meetings before and after them. I saw government representatives distinguishing themselves only by their shiny cars and interminable speeches (even when they were limited to 7 minutes each, some felt interminable), the non-governmental community by its energy and verve, but few real accomplishments, and the “have-nots” by, more often than not, their absence and invisibility. Yes, I think people are beginning to understand. The only way to fight the power structure is keep away from them, ignore them, and build your own projects, communities, a new commons economy – see what the American Occupy movement is doing – and the small snowball will roll and roll and get bigger until a revolutionary movement will be strong enough to overthrown the current system based on the special interests of the plutocrats who already run the show in the United States. See what’s happening there with the super PACs. Money rules supreme. But sooner or later, the people will win, and the plutocrats will lose.